This helicopter, being based in Taupo means it responds quickly to the Central Plateau area when weather in other areas might prevent other helicopters from reaching this area. It is outfitted and equipped the way it is largely by public donations and suits the environments it operates in, servicing not just remote locations but also the highest altitude highways in the North Island, the two largest commercial ski-fields in New Zealand and the busiest one day hiking track in New Zealand and the largest area Lake in New Zealand. 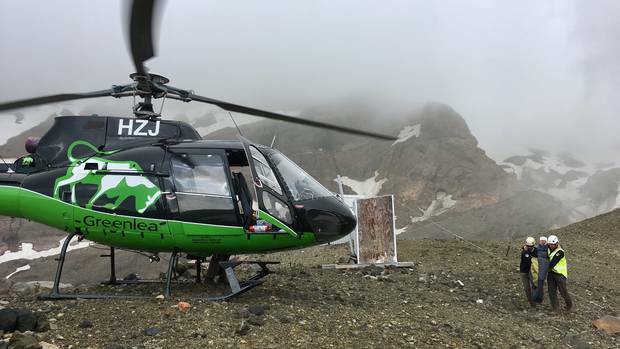 NZ Mountain Safety Council identifies the Central North Island as an area where the highest number of outdoor activity incidents resulting in injury occur each year. Most importantly, the intimate knowledge that has been accrued in terms of flying in local mountain weather conditions, the capabilities of the ground teams that the helicopter works with, their resources and team culture will simply not be able to be replicated by a helicopter and crew that is based out of district. This understanding of how people operates goes in both directions, with ground crews needing to train with the helicopter and crew frequently to make rescue and other emergency work go smoothly and safely. On numerous occasions each year Greenlea Rescue is been one of several attending road crashes and other major incidents, so reducing the number of these resources is creating an unacceptable risk, especially should any of these machines experience any unforseen mechanical issues, having a quick substitute nearby will serve the public to a level that they deserve and expect. Should an incident occur on our local mountains Greenlea can uplift a ground team and have them at the patient’s side before a Hamilton based machine could even get into the general area. Discontinuing funding for this helicopter and removing it from service will lead to lives being lost. Local Members of Parliament, district councils, business groups and individual businesses have come out in support of the Greenlea Rescue Helicopter. On Thursday night, a colleague sent me a copy of the first part of the NASO Request for Tender document for the provision of air ambulance services across New Zealand. Friday, I was working all day on the Tongariro Alpine Crossing and so have only been able to examine this document this morning. Incidentally, while up on the Crossing, yesterday, the Greenlea Rescue Helicopter performed an evacuation of a hiker with a broken ankle. Here, regardless of whether it is operating in an air ambulance or search and rescue role, we refer to these helicopters as rescue helicopters. We do this because that it what they do, regardless of whether they are operating at the time under and ambulance or search funding stream – the same service receives funding from various government agencies depending on its role at the time. If yesterday’s broken ankle patient had been injured crossing the street, an ambulance would have been called. In this instance, the ambulance deployed was the Greenlea Rescue helicopter, based in Taupo. Let’s not get wrapped around the axle with semantics. This is the original map used by the NZ Herald and included in Thursday’s post. This image is drawn directly from the RFP. The Statement that “…The figure below illustrates the 95 percent coverage from bases that currently provide Services…” is inaccurate. 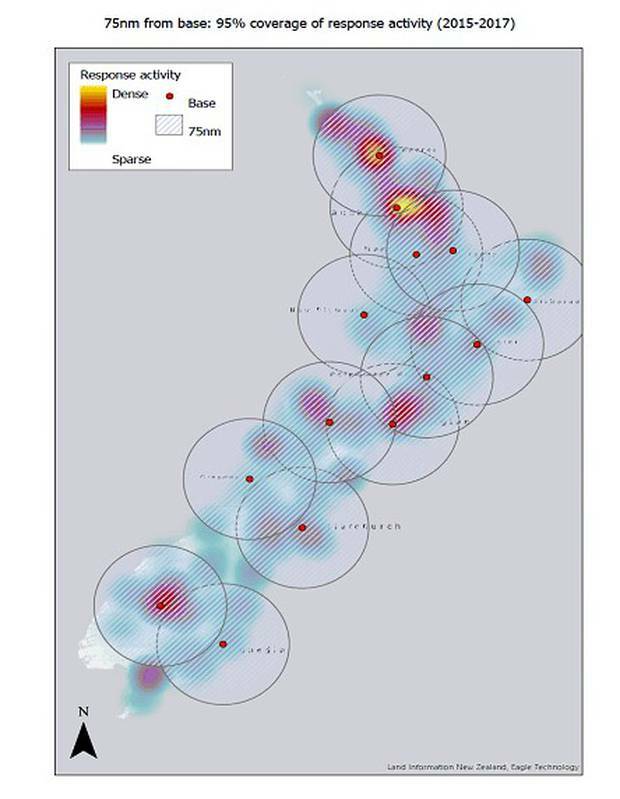 This map purporting to show the bases that currently provide [air ambulance] services omits the bases at Rotorua (229 missions) and Taupo (237 missions) , bases that, according to stats published by the Herald, are busier than the base at Tauranga (203 missions) that IS shown on this map. the additional flying time is still a factor that cannot be mitigated away. The crews would still lack the intimate local knowledge that makes our local rescue helicopters so effective. While our current fight is to retain the rescue helicopter bases at Taupo and Rotorua, it’s probably worthwhile to take a look at some other aspects of the RFP document. Performance Class 1 essentially means that a twin engine helicopter can safely land, take-off or continue in flight if it suffers the loss of an engine. Our current single-engine helicopters operate safely and effectively. Modern single-engine helicopters are not falling out of the sky on a regular basis, here or overseas. If anything, ongoing advances in engine technology are making modern engines more and more reliable – why do you think more modern airliners e.g. Boeing 757, 767, 777 and 787 can safely operate over large bodies of water with only two engines (no spares)? Could NASO please share the statistics and data that support this call for twin-engined helicopters with no doubt greater capability but commensurately higher operating costs? You can ask NASO for this information here: airambulance@naso.govt.nz It’s interesting to note that of all the agencies contacted since this issue erupted, NASO is the only one to not respond. How often does a rescue helicopter in New Zealand have to carry two patients? My assumption would be less commonly than cases where there is only a single patient. More than one patient increases the requirements for clinical crew, especially where a critical patient might require the ongoing attentions of two paramedics. Could NASO please share the statistics and data that support this requirement? Again we can ask them here: airambulance@naso.govt.nz. One of the objectives for the interim Emergency Air Ambulance Service that this RFP seeks to replace was “…That it is essential that people get the right care, at the right time, in the right place from the right person...” Will NASO still be able to meet this standard, especially in regard to AT THE RIGHT TIME…? It’s nice that NASO wants to move to a single integrated air ambulance service across New Zealand. Certainly it might make the bureaucracy easier. But is what we have at the moment really broken? Can we afford a shift to single provider model? Is there a single provider than can provide this service across the country? Is this RFP ultimately just blowing in the wind…? That NASO failed to consult with affected communities is indicative that this RFP may be driven more by efficiency than effectiveness. Surely, as part of developing the requirements for the tender, NASO would need to talk to local communities e.g. councils, Police, SAR, etc to get a feel for the true need? Surely, a savvy government ofice would ensure that affected Members of Parliament were read into the plan before the story broke…?